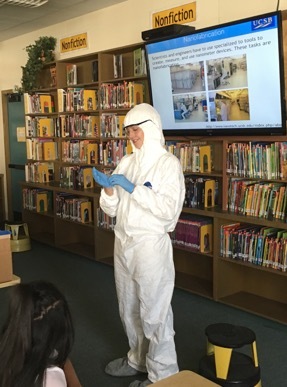 UCSB graduate student Claire McLellan shows students how to put on a bunny suit, the garment required to enter nanofabrication facilities. Jenna Campbell, a scientist at Freedom Photonics, discusses her career with students at Santa Barbara Junior High School as part of Women in Photonics and Manufacturing Week, an event put on by the Photonics Society at UCSB. Jell-O, water tanks and laser beams. Using these simple tools, four female scientists gave a group of 28 girls a lesson in light technologies and a primer in photonics, the science of light. The event at Girls Inc. Goleta was part of Women in Photonics and Manufacturing Week, a slate of programs organized by the Photonics Society at UC Santa Barbara aimed at introducing girls of all ages to the field of photonics. Intended to inspire the students to pursue careers in photonics, the activity guided the 9-12-year-old girls through interactive lessons on the role of photonics technologies in their lives. Held in partnership with the American Institute for Manufacturing Integrated Photonics (AIM Photonics) and the Center for Science and Engineering Partnerships (CSEP) at UCSB, Women in Photonics and Manufacturing Week also included tours of local Santa Barbara photonics companies, career talks from women working in the field of photonics and photonics outreach activities. The event brought together 11 females working in photonics, from UCSB graduate students to research scientists in the field, who traveled around Santa Barbara and Goleta to introduce girls to photonics and seed inspiration to pursue careers in science-related fields. The local program was held to celebrate the IEEE Photonics Society’s Introduce a Girl to Photonics Week, IEEE Day and Manufacturing Day. “We have a thriving photonics community here in Santa Barbara, and we wanted a way to leverage that to help get girls excited about pursuing careers in this field,” said Demis John, industry liaison for the Photonics Society at UCSB. In total, over 100 students and their parents in the local Santa Barbara community participated in the week’s events. “Because there are not many women in engineering, I think women need encouragement to be involved in engineering as equally as men,” said Biljana Stamenic, a senior development engineer at the UCSB Nanofabrication Facility. Hirokawa reiterated Stamenic’s sentiments, saying that she is committed to volunteering for science outreach activities because she wants “to be a concrete example of a real scientist for the young girls.